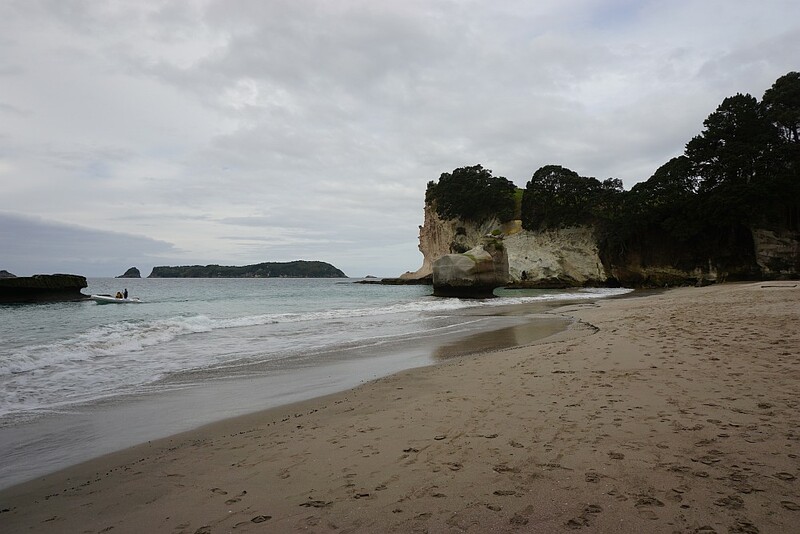 Cathedral Cove with its small sandy beach is only accessible by boat, or by foot from Hahei. 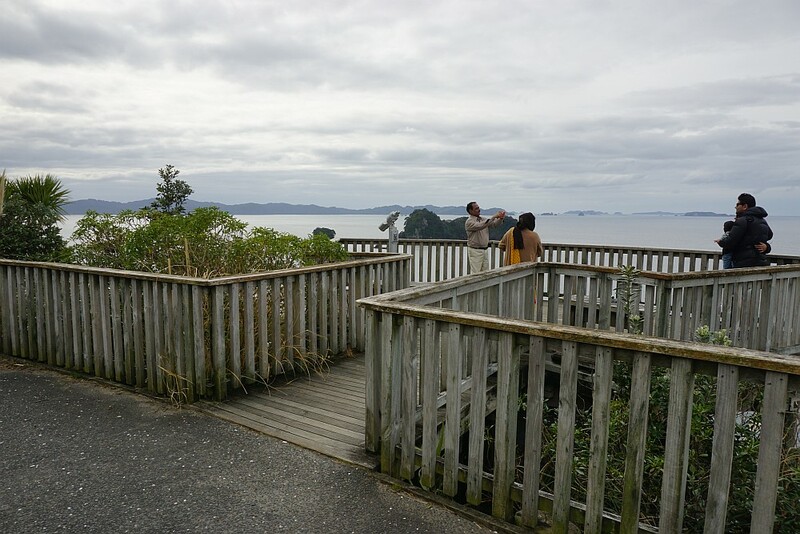 The walkway is accessible from either Hahei Beach, or from the end of Grange Road, north-west of Hahei. 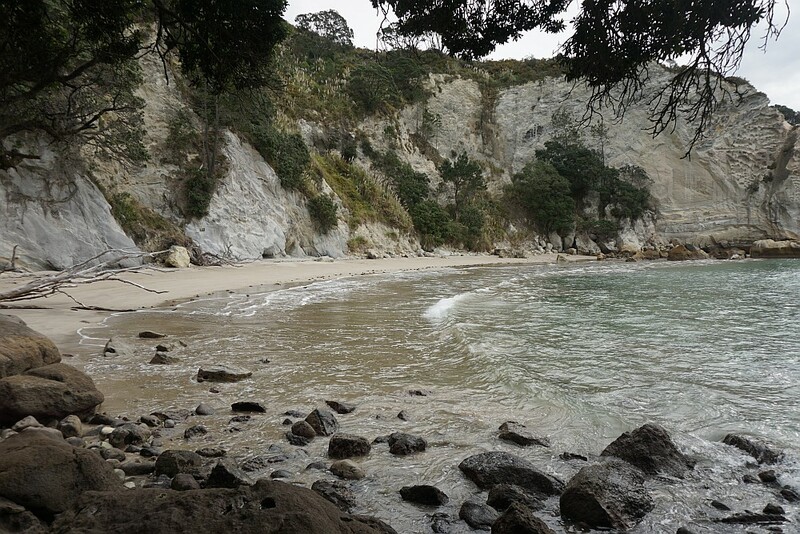 Two other beaches, a sandy beach in Stingray Bay and a stony beach in Gemstone Bay, are accessible on short side tracks from the same walkway. 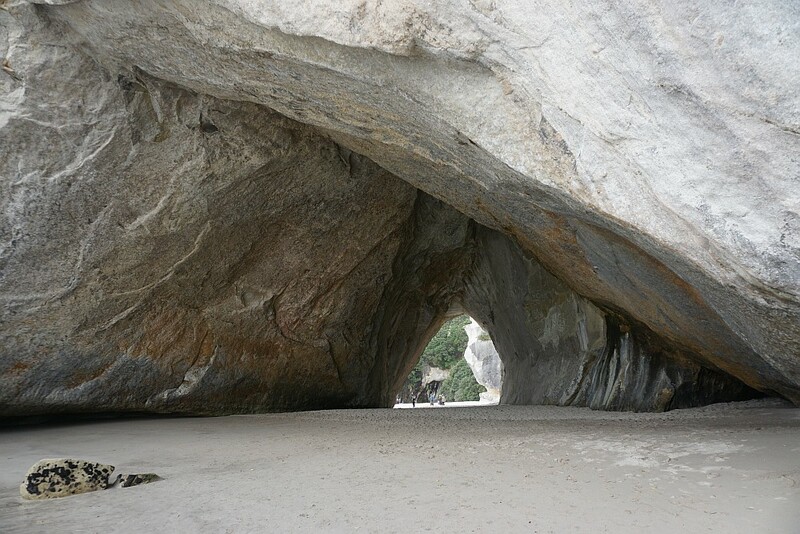 The rock arch, or cathedral, is an archway or cave linking Cathedral Cove and Mares Leg Cove. It is a popular destination for both tourists and locals, so the walkway can be busy all year round. The track is well formed and easy, without significant elevation changes, except for a short section with steps at the Mares Leg Cove end of the track. There is a parking area at the end of Grange Road, including parking for campervans, but even on a winter’s day there may be no parking spaces available. There are basic toilet facilities by the carpark, as well as a lookout and information panels. 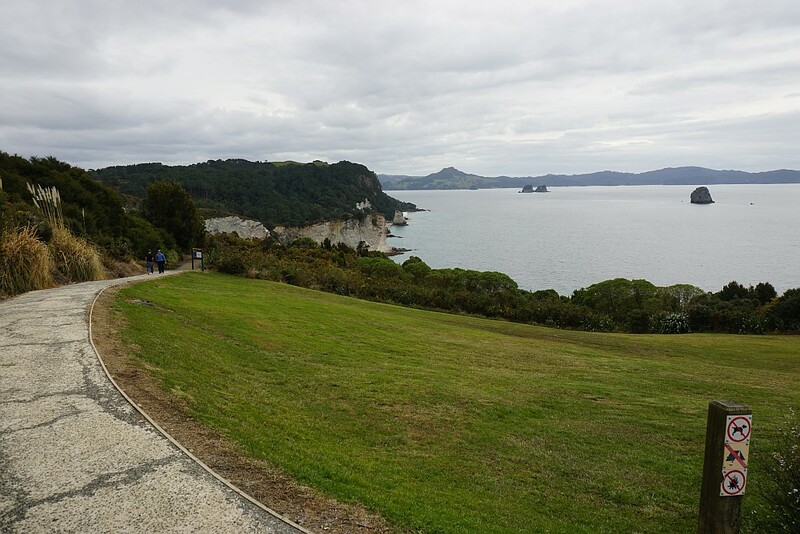 The walk from Hahei Beach to the lookout and carpark on Grange Road should add about 30 minutes to the duration of the walk in each direction. 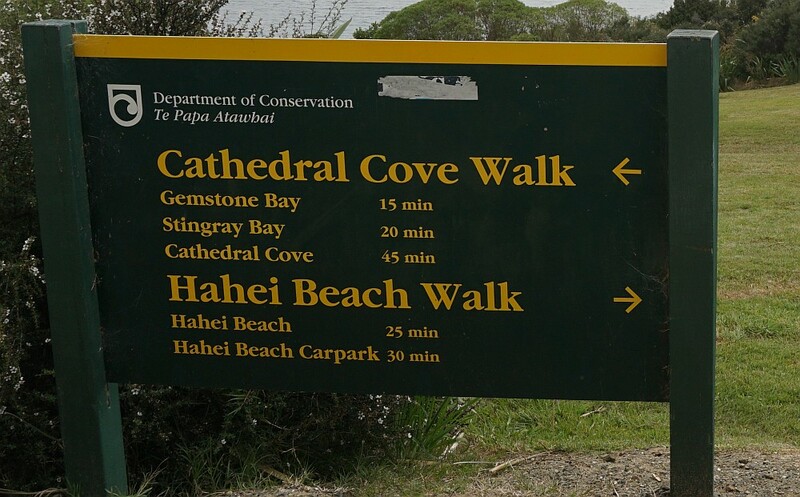 From the carpark to Cathedral Cove is signposted as a 45-minute walk, but using the direct track took just under 30 minutes. 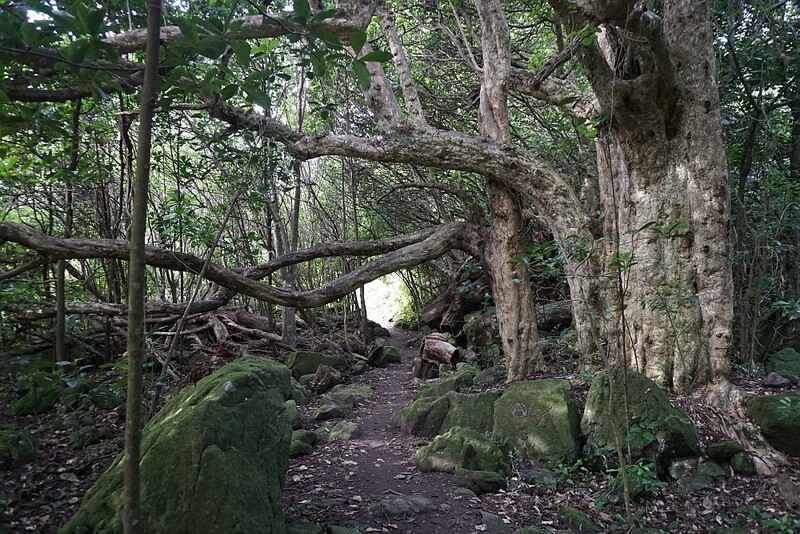 A short detour through a puriri grove bypasses the track to Stingray Bay, and is rougher and narrower than the main track. 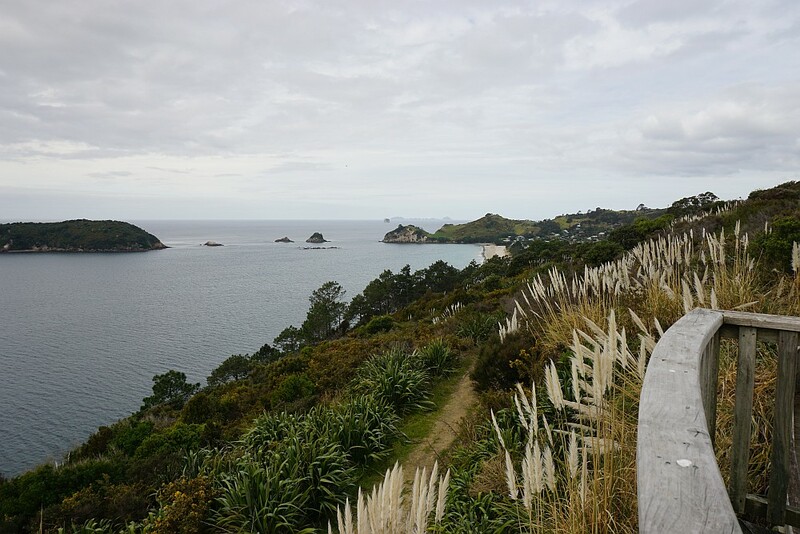 The return from Cathedral Cove to the carpark, via the puriri grove, and the side tracks to Stingray Bay and Gemstone Bay, took just under 50 minutes. 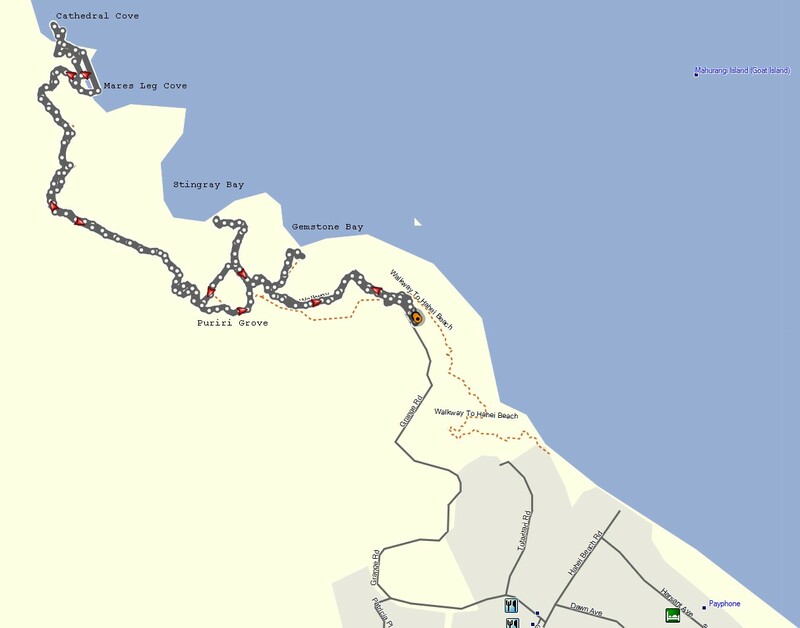 Information about the track and Cathedral Cove, as well as some photos, are available on the DoC web site. 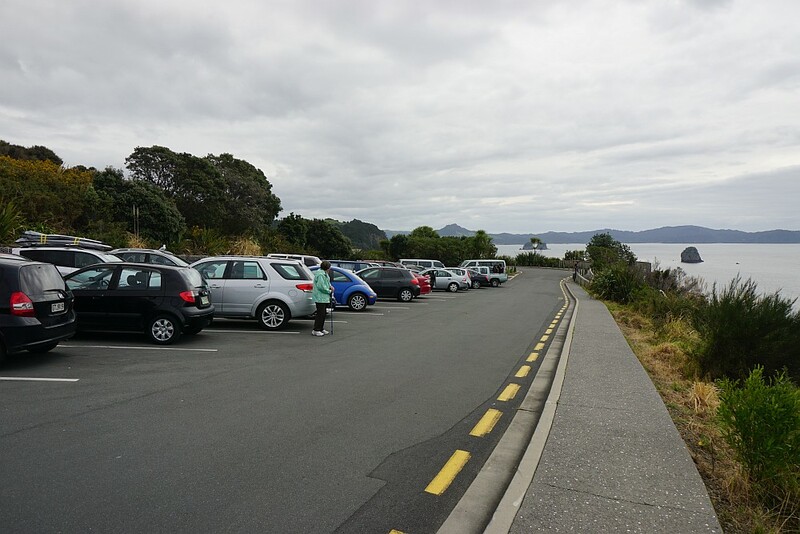 The parking area at the end of Grange Road, Hahei. 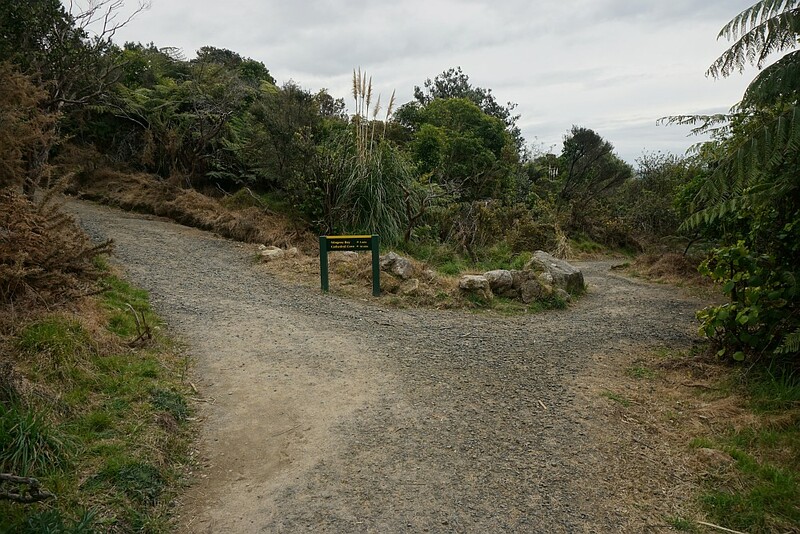 The lookout and the start of the walking track is at the far end on the right. The upper level of the lookout. 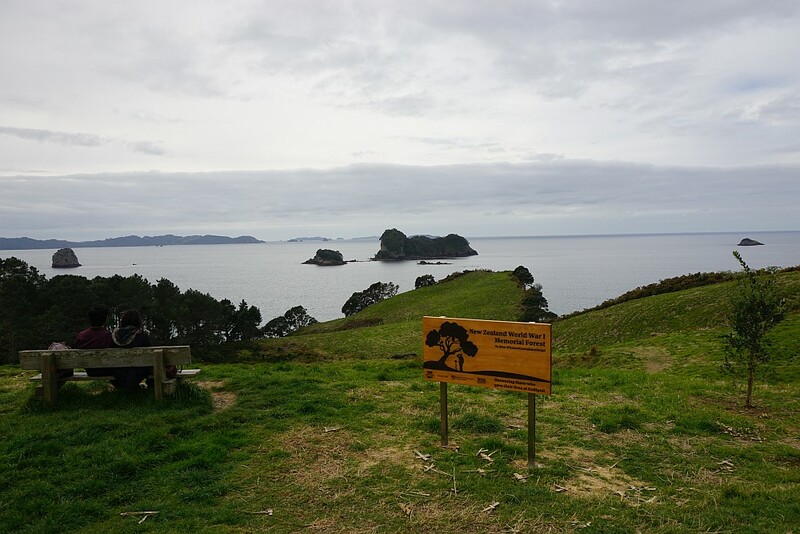 The lower level has information panels about the area and the Te Whanganui-A-Hei (Cathedral Cove) Marine Reserve which covers some of the offshore area including some smaller islands. Views from the lookout on a cloudy day. DoC information panel at the start of the walkway, by the lookout. The walkway starts on a gentle downhill slope. Almost the entire main track is wide and well-formed. Here at the turnoff to Gemstone Bay on the right. The turnoff to Stingray Bay. 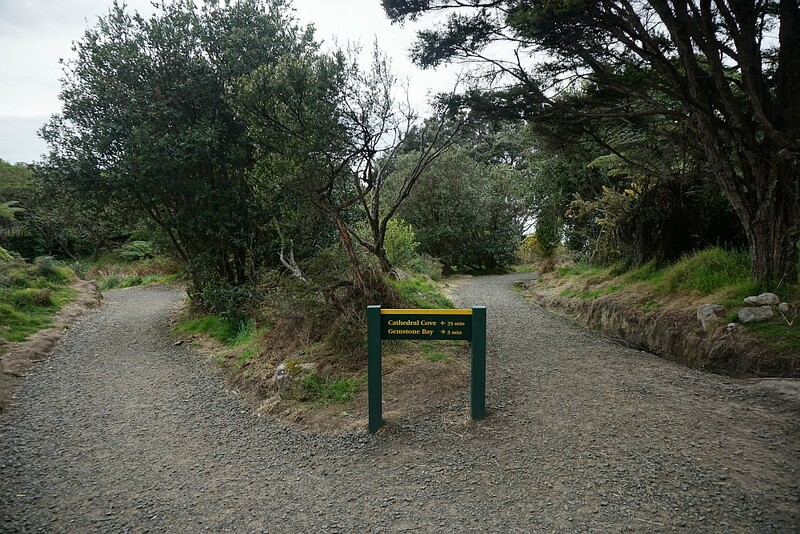 The eastern end of the puriri grove detour can be found between these two side tracks. 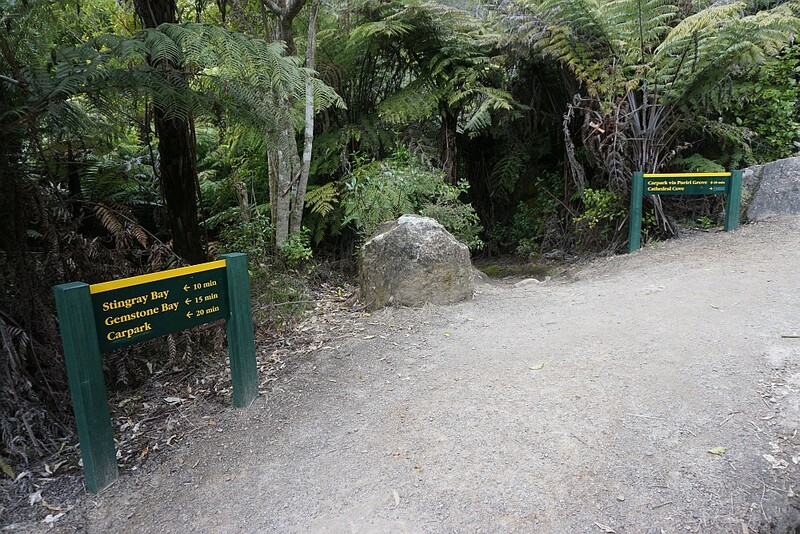 The western end of the puriri grove track. The track is just to the left of the right-hand sign. Planting has recently taken place to establish a World War I Memorial Forest, marking 100 years since the start of New Zealand participation in the war. The walkway will pass through the forest which will cover the grassland area. 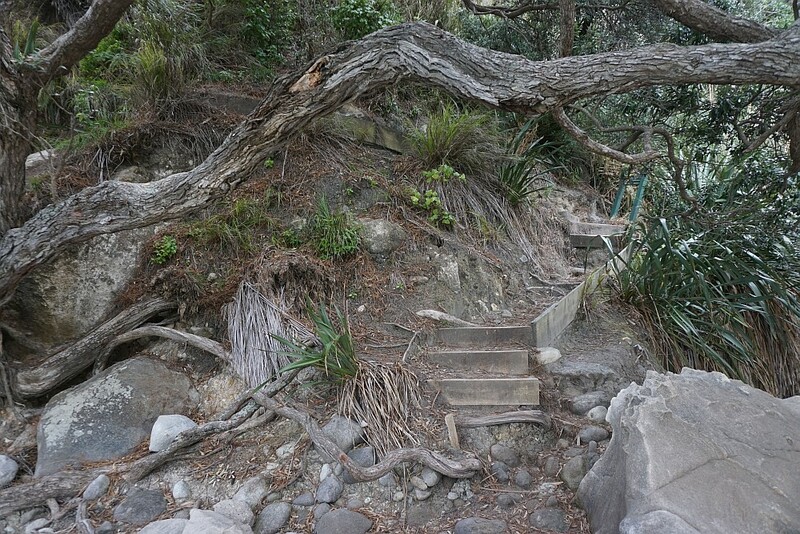 The final steps leading down to Mares Leg Cove and Cathedral Cove. 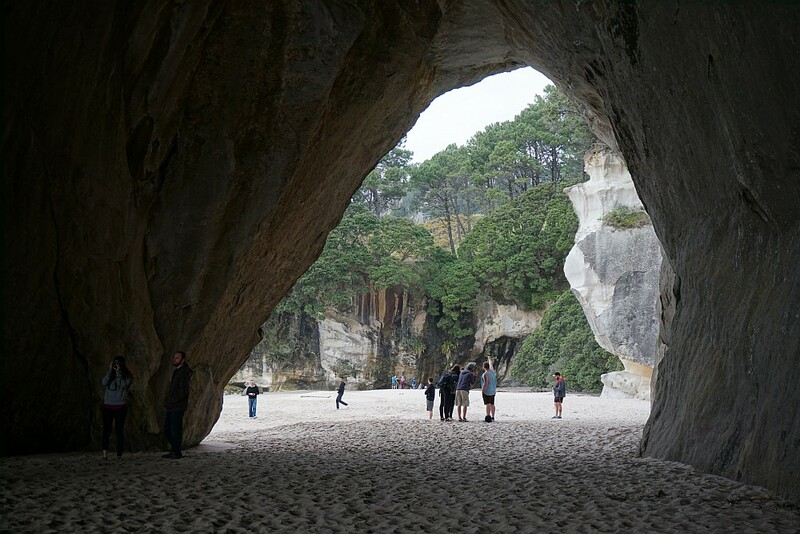 Looking through the arch from Mares Leg Cove to Cathedral Cove. The beach at Mares Leg Cove. 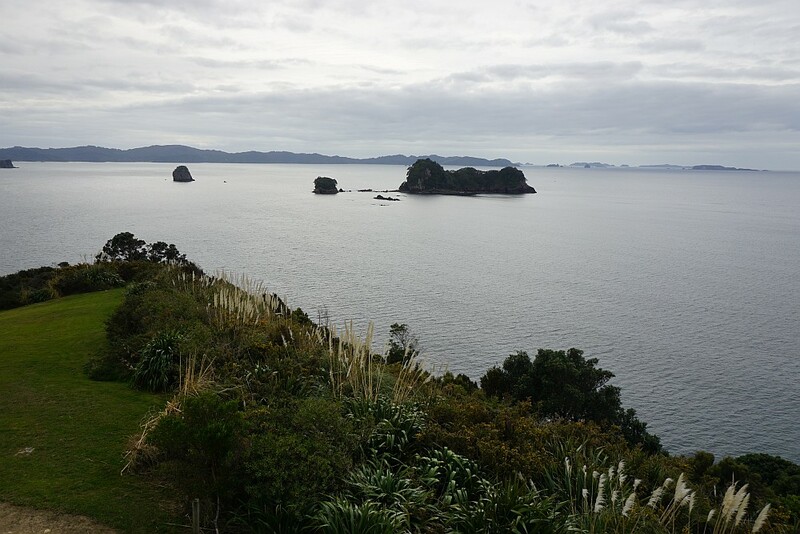 The boat takes visitors to the coves from Hahei, but didn’t come ashore. 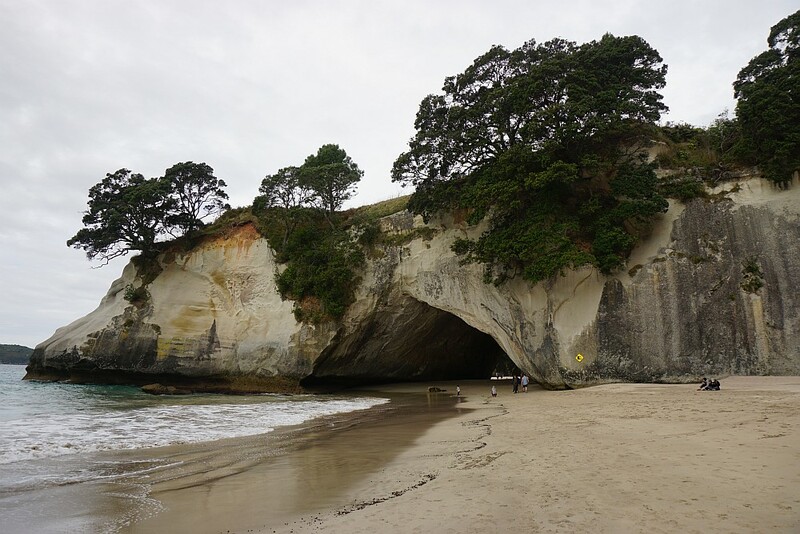 Looking through the arch from Cathedral Cove to Mares Leg Cove. 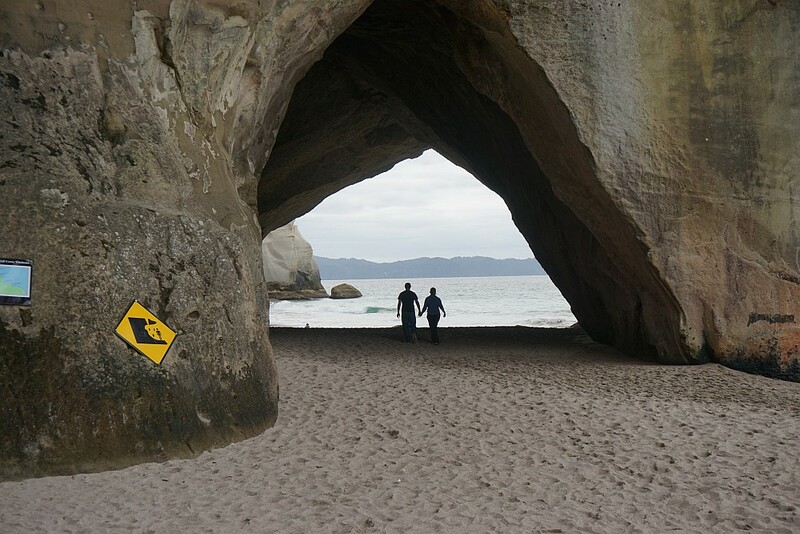 The arch seen from Cathedral Cove. 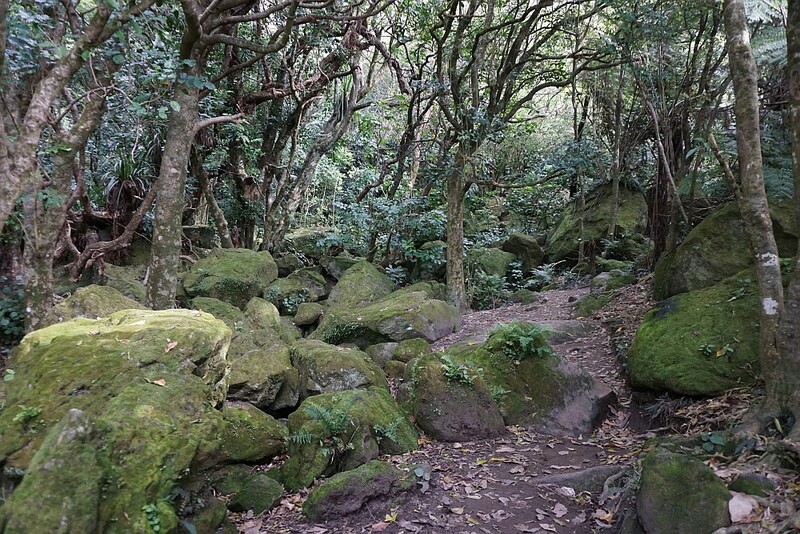 Moss-covered rocks on part of the puriri grove track. Puriri trees by the puriri grove track. 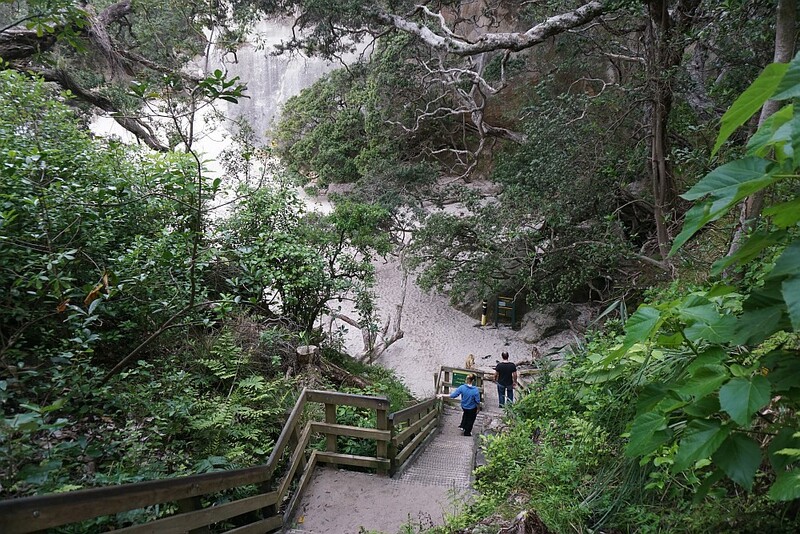 The track to Stingray Bay is steeper, narrower and rougher than the main one to Cathedral Cove. Stingray Bay has boulders at one end of the beach. The far end is too dangerous to access due to falling boulders and debris from the cliffs. 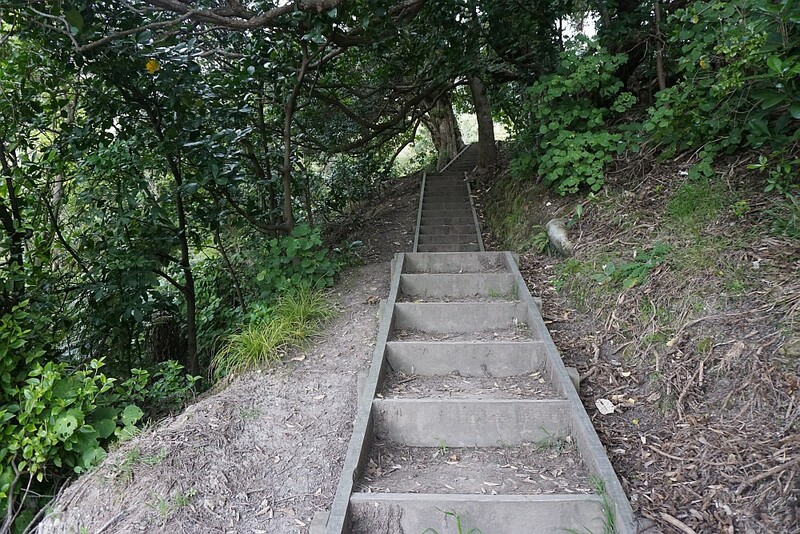 The track to Gemstone Bay is well formed, with steps on the steeper parts. Gemstone Bay beach is covered with boulders. It is a popular location for snorkelling, and has a marked snorkel trail. Two of the markers can be seen above the information sign. The GPS tracklog shows the various tracks and features. Highest elevation is at the carpark at about 95 metres above sea level. Distance using the direct track from the carpark to Mares Leg Cove is about 1.7 km, and took less than 30 minutes. Total distance walked was 4.8 km, and total time just under 1.5 hours, including time spent at the coves. The track was walked on August 29, 2015. 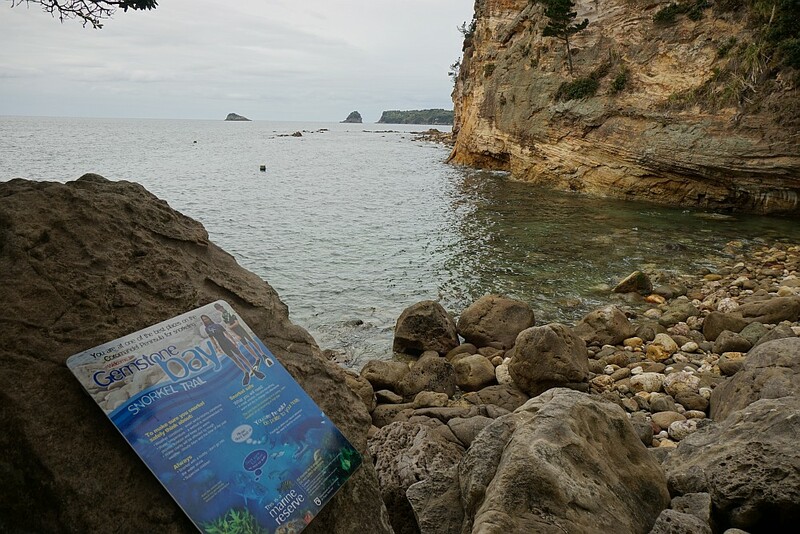 This entry was posted in Walks and tagged Cathedral Cove, Coromandel, Gemstone Bay, Hahei, Stingray Bay on 2015-09-02 by nzartig.